Dave Billings has been around art all his life. His father Ken was a talented artist and photographer, with a second degree in Printmaking from SMU in Dallas, where his mom Anne also earned a law degree. David’s parents originally met at Stanford, and instilled in David and his older brother Richard their thirst for knowledge, entrepreneurship and exploration of the world. David was trained in art at an early age, and was fortunate to be introduced to a wealth of opportunities at St. Marks School in Dallas, and at SMU where David worked as an Assistant to Professor Jon Minyard in the bronze-casting department. He also worked briefly at the Shidoni Foundry in Tesuque, New Mexico, broadening his skills. After graduating from Highland Park High School, Billings attended Richland College with his brother Richard, where they met a growing art community, and focused on forging a future path in the arts. The Billings Brothers held several successful two-man shows at the college and several galleries in Dallas. Dave Billings then ventured out to study sculpture intensively in Pietrasanta, Italy, in the Carrara marble region, where he worked in a cooperative marble studio with other artists and local craftsmen. Billings then traveled around the world on Semester at Sea, where he studied photography and the psychology of art, as well as the art and cultures of the countries they visited. In 1985 Billings moved to Los Angeles, where he attended the Otis Art Institute of the Parsons School of Design, graduating in 1988 with a degree in Fine Art and a minor in Video Production. Newly married to his childhood sweetheart Margaret, and wanting and needing a steady income, Billings took an entry level job working for Yonex Corp. in Torrance, CA, fell in love with the game of golf, and has worked in the Golf industry ever since. Billings held six titles in three years with Yonex, including R&D Coordinator, where he was responsible for coordinating new product development, product launches, the tour program, PR and promotional opportunities. Shortly after the birth of their first son David, the Billings’ returned from California to Dallas. Billings worked as Director of Marketing for Affluent Golf, a company Ray Cook started after selling his namesake. Unfortunately Mr. Cook’s health was declining and the business was shuttered. After managing several golf retail stores, Billings landed back on the manufacturer side as Product Manager for HEAD Golf in Ft. Worth, Texas. It was there where Billings and Tom Stites first worked together. When HEAD relocated and disbanded, Billing formed Big D Industrial Designs, and did work with Stites new company Impact Golf Technologies, and also others including Mizuno, Nicklaus and HEAD, among many others. While working on a carry bag invention, Billings watched his then 2-year old son David putt a ball with a bag tube, and the idea the HOG Putter was born in one of those “Eureka!” moments. Billings applied for and eventually received two utility patents for the oversized shaft and the totally oversized golf club. He also received USGA conformity, as he developed a business plan with his lifelong friend Mitch Cox. Billings sketched a drawing of the family dog Birdie, and the first Dogleg Right Dog & ball logos were created. With a modest $12,500 in seed capital, and a lot of big dreams, Dogleg Right was born. In the 18 plus years since, Billings has worked one-on-one with many of the greatest names in the game who have trusted his talents and skills to make the most important club in their bags. Names like Snead, Palmer, Player, Watson, Weiskopf, Nelson, Littler, Jacklin, Jacobs, Floyd and Quigley, Thompson, Furyk, Janzen, Perry, Boros, Bryant, Clark, Funk and Moore, just to name a few of the hundreds of pros who have gamed Billings’ creations. Billings has also enjoyed great friendships and past endorsements from some of the greatest teachers in the game, including Jim McLean (HOG putters infomercial 1999-2000) and Hank Haney (Machine Grips, reverse arch grips, MACHINE Putter Studio at Hank Haney Golf worldwide headquarters 2007 – 2011) among many others. 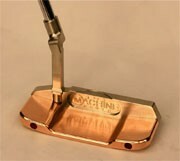 Countless pro athletes and celebrities are also owners, users and collectors of Billings putters. Billings has been awarded 11 United States and one International Patent for his inventions so far, including two Design Patents, 9 Utility Patents and one Method Patent, with numerous other Patents Pending. These Patent Portfolios cover some of the most important and dynamic fields in the sport, including adjustable weighting, modular hosels and other technologies making major impacts on the industry and the game of golf. Billings still uses his artistic and design skills in virtually every aspect of the conceptual, R&D and product development processes for products Dogleg Right manufactures, licenses and sells. From initial sketches of new concepts, to 2- and 3D CAD designs, to working with programmers and machinists on tooling path and all other CNC machining variables, Billings doesn’t like to leave any detail to chance, nor cut any corners. Once the products are machined, and the process further refined through numerous prototypes, test and setup pieces, Billings really goes to work, personally hand-finishing his best works, sometimes with Patina’s and custom milling work he invents on the fly, constantly coming up with new and exciting work that drives him and inspires his customers and fans worldwide. We believe that Dave Billings’ pride of authorship, passion for his work and attention to detail comes through in the finished product, and hope that you will be pleased and proud to own one of his creations. Dave writes about his past experiences and provides humorous and entertaining stories on his own blogs. 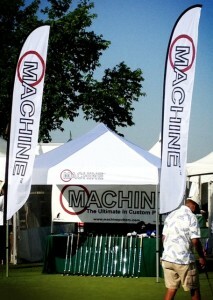 As well as the company Facebook page, Twitter, and on numerous golf forums as well, including Golfwrx.com, MyGolfSpy.com, Puttertalk.com and others. Check out these links and more under Dave’s Social section from the pull down menu above and under Golf Community.